Another Wednesday, so another blog post. Not that I have been up to much. I am attempting organize my craft book shelves. It is a major undertaking. At one time each shelf held one type of craft. Not anymore, so I need a new system. I sit and stare at the piles hoping that each book will magically fly into its perfect place. That hasn’t happened yet. Maybe tomorrow. I think I started on the bookshelves because I don’t know which project I want to start, Rick’s shirt or the twenties top. Maybe tomorrow I’ll decide. The other day I thought I needed some exercise and decided I would go for a walk along one of the walking and bike trails we have here. I took the camera thinking I would get some nice photos. 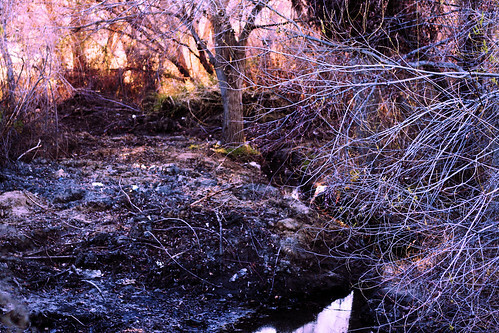 Well, it isn’t really pretty here this time of year, everything is dormant, and grey. It was a little creepy too. A few bikes sped past, but not any walkers. At one point I actually wondered if the big paw prints I saw were from a dog or a cougar. It wasn’t a complete failure though. After pointing clicking away, I noticed that if I shot into the sun that the photos were even creepier than if I took them with the sun to my back. It is a little hard to see what I am actually shooting, but fun anyway. Here is my creepiest shot of the day. For something a little cheerier, the poinsettia that was bought for a table center 4 years ago and is still alive and well in its original pot has decided to turn red. I placed the pot in a north east window and the plant is now the size of a small shrub. I don’t know if or how to prune it. The foliage is pretty all year long. 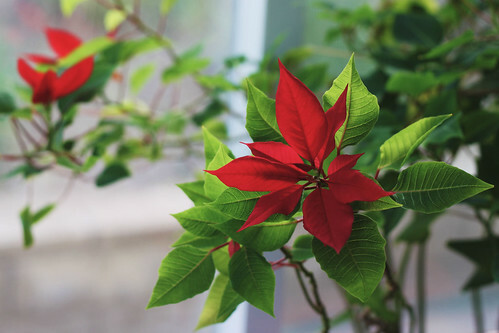 I didn’t realize poinsettias make such great house plants. This entry was posted on Wednesday, February 6th, 2013 at 6:36 pm and is filed under Photography. Tagged: Garden, Photo. You can feed this entry. You can leave a response, or trackback from your own site.